Did you know? In mating, several competing males form a breeding ball around one female which can last up to four weeks. Anaconda is a large, non-venomous snake found in tropical South America. They are found mostly in water, such as the Amazon River. 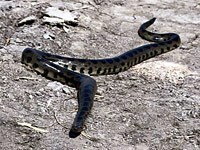 Although the name actually applies to a group of snakes, it is often used to refer only to one species in particular, the common or green anaconda, Eunectes murinus, which is one of the largest snakes in the world. How long can an Anaconda grow? 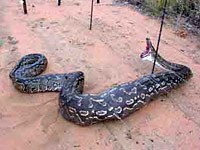 There is some debate about the maximum size of anacondas, and there have been unverified claims of enormous snakes alleged to be as long as 30 to 45 m (98.4 to 147.6 ft). According to Lee Krystek, a 1944 petroleum expedition in Colombia claimed to have measured an 11.43 m (37.5 ft) specimen, but this claim is not regarded as reliable; perhaps a more credible report came from scientist Vincent Roth, who claimed to have shot and killed a 10.3 m (33.8 ft) specimen. How did the anaconda get it's name? Because ana means big and conda means snake in indian language. That's why the Native Americans named it Anaconda which means bigsnake. 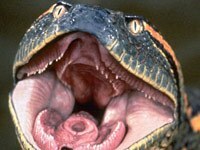 What are the anaconda predators? 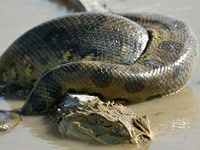 The Anaconda is a very powerful creature it can kill almost anything from capybaras to Caimans. 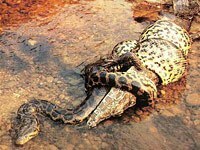 Anacondas have two natural predators, the Caiman and the Jaguar, the Caiman preys on small-sized Anacondas, the Jaguar, However, preys on large Anacondas. Download free Anaconda wallpapers, click on the image to open the large version. Print free Anaconda coloring pages, click on the image to open the large version.